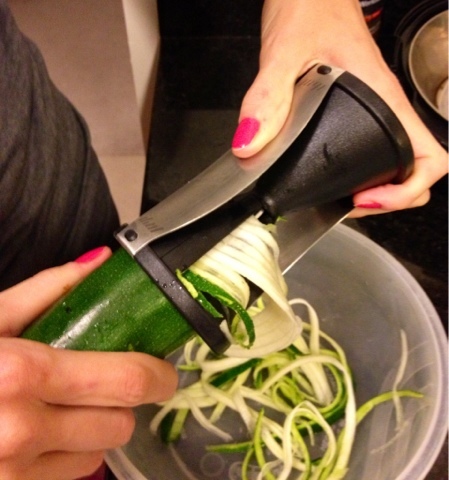 Healthy Fit Goddess: New Vegetable Spiralizer! After doing some research on Amazon and on other blogs, I decided to purchase this GEFU Spirelli Spiral Cutter. The reviews were somewhat mixed but the small size of this appliance compared to others really attracted me. I have a small kitchen so I don't like to collect big appliances. Plus, it was only $23.55. The picture above shows me using the spiralizer with a zucchini. I was really skeptical about this tool when I opened the box because it looked really small and flimsy. However, I was extremely surprised at how easy it was to use and how well it turned the zucchini into pasta-like noodles. It was really easy to rotate the vegetable through the spiralizer. It even has a hole left in the middle so you don't use the seed part in your noodles. There are also two sizes of strips you can make. Below is the finished product of the whole zucchini and I just added some tomato sauce and olives to make my lunch. What a fun way to eat vegetables!! 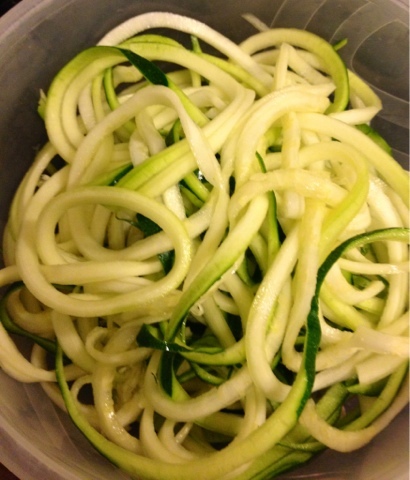 Do you have any good recipes that use spiralized vegetables?